Well it has been a busy few weeks and I can’t believe how quickly time has past. This time next week the GC Marathon will be behind me! My training has been a bit all over the place, niggling calf problems have disrupted my training and caused me no end of grief – plus I’ve been crazy busy at work. I’ve had a few visits to the Osteopath/Physio/Sport Massage person (Lisa) who has worked hard on my soleus muscles to try and reduce the pain and increase my flexibility. I’ve even resorted to acupuncture (on her request) to try and loosen the muscles. Well they are a bit better now, not 100% but I think the pain is manageable enough to get through the race, but I’m less confident about my time now – which is so disappointing.. but I haven’t given up just yet.. 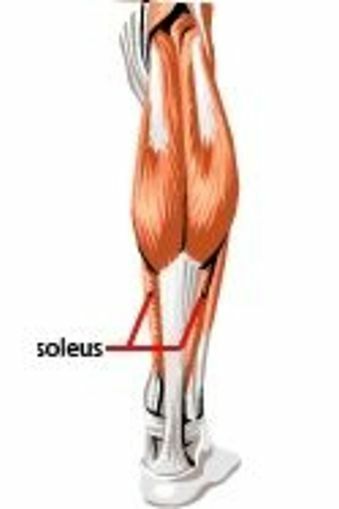 So what is the Soleus muscle? Well, thanks to Google and my Osteo I can tell you that the soleus is a major contributor in the biomechanical chain and one of the most frequently used muscles in the body. And, when it starts to misbehave, it tends to drag the other leg muscles down with it and it is seriously difficult to hold form when the soleus is hurting. How did I hurt the soleus? I think in my long run in Tassie I did not follow my normal warm down procedure, rushing the stretching and no ice. The Osteo’s advice, was be diligent in icing after a long run and stretching the soleus… whoops! It would seem that hills running is a contributing factor and I notice that running hills causes me much more pain than on the flat. Since my first visit to the Osteo I’ve pushed out a few decent runs, but I had to abandon the high altitude training on the treadmill as I think treadmill running was not helping me. Also, I’ve broken from the official training program as I was becoming more concerned about breaking down with injury and not even making it to the starting line. As you know I am running the Gold Coast Marathon to raise money for Alzheimer’s Australia Victoria and the fundraising is going well but it would be devastating not to compete! Especially after all the amazing support I have received. Also, I mentioned in my last post that The Manningham Leader newspaper had interviewed and photographed me for an article about the fundraising – would be pretty embarrassing not to get to the race if/when the article goes to press!!! Btw, if you haven’t had a chance to check out the fundraising please have a look at the About My Blog section ( https://gpontherun.com/about-my-blog/ ) to find out more and link you through to other sites – and one again a BIG THANKS to all of you who have supported me and provided so much encouragement. My lesson from this run was that if I can handle the pain the run will improve. Not sure that will work over 3-4 hours but for a short run it did. After seeing the Osteo and knowing that I was unlikely to cause an damage by running with tight soleus’ it was just a matter of putting up with the pain and doing my best to hold form. Running with tight calves isn’t pretty – but I’d rather be running ugly than not running at all! 19 June – 3.06 kms – in 20 or so minutes – Missy (the golden retriever with OCD) and I headed down the Mullum Mullum Creek trail for some medium intensity interval running. 24 June – After a 7km bike ride to an athletics track, I then ran 11.5kms in an hour. It was fantastic running on a flat track and a surface that had plenty of bounce. The calves were sore but it was manageable. Diane met me down there and got some running in also. But how boring is it running around in circles!!!! After every run now I am diligent with my stretching. I also hop into the saltwater pool at home up to my thighs as part of my recovery. You are probably thinking – Melbourne’s coldest winter in years the pool water must be cold? Well it’s not cold – it is absolutely FREEZING! But… I think it is helping…. or maybe it’s just because I’m numb. Following today’s run I will not run again before the race. I will in stead hop on one of my least favourite pieces of gym equipment the eliptical or cross training machine on run days. It seems to stretch the calves without the impact – hopefully it works!!!! I figure my cardio fitness is good, I have the kms in the legs – better to let my body recover than over stress the body to the point I am in serious pain before the start of the race – will make it a very long race in deed!! 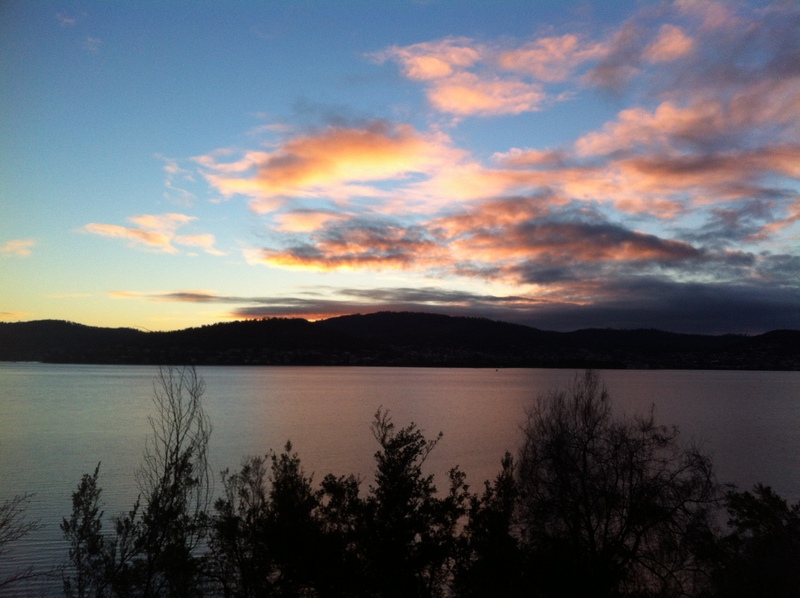 I promised to write more about our escapades in Tassie, but it will probably be after the race when I post that – but here is a photo I took on my early morning run to whet the appetite – what an awesome view! Early morning run in Tasmania. With less than a week to go I will try and post one more time before heading off. Any tips on how to keep my legs from failing me gratefully received! This entry was posted in Fight Dementia, Fund Raising, Marathon Training and tagged alzheimer's, alzheimer's australia, dementia, dogs, endomondo, fight dementia, fundraising, Gold Coast Marathon, golden retriever, gym, intervals, marathon, melbourne, playlist, runners, running, running music, soleus muscle, sore calves, Tasmania, training, walking the dog. Bookmark the permalink.